A Superior Court judge on Wednesday denied a motion by the City of Asheville to dismiss a lawsuit that seeks to have the results of last November’s $74 bond referendum declared invalid on grounds that the bond language was misleading. 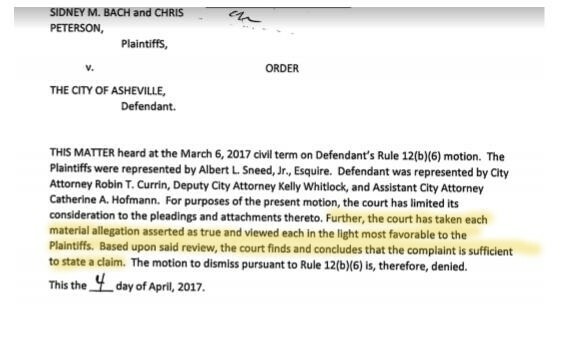 Judge R. Greg Horne said in his order that the action, brought by retired attorney Sidney M. Bach and former Asheville Vice Mayor Chris Peterson, “is sufficient to state a claim,” meaning that the case will now proceed. The public notices advertising referendum said the city “shall” or “will” levy new taxes in an amount sufficient to pay for the bonds. But a subsequent city council resolution backed off that language and substituted the phrase “may be levied,” making it sound as though there were a possibility issuing the bonds might not, after all, result in a tax increase. “May be levied” was the wording used on the actual ballot. But, the suit alleges, the city was always fully aware that the bonds, if passed, would raise taxes. Changing the wording to “may” on the ballots rendered the entire statement false and constituted a misrepresentation, the suit says. Asheville Attorney Albert Sneed is representing Bach and Peterson. Judge Horne’s order names City Attorney Robin Currin, Deputy City Attorney Kelly Whitlock, and Assistant City Attorney Catherine Hofmann as counsel for the city.